The ASUG Virginia Chapter is looking for volunteers in the Central Virginia/Hampton Roads/Roanoke areas. Please apply today. Volunteers are the lifeblood of the ASUG Virginia chapter. We support thousands of ASUG members in the Virginia area, manage 2-3 events per year, providing professional development opportunities. When you volunteer, you become part of a larger team where you will meet and work with other fellow SAP community members on a wide variety of topics. No matter what your interests are, ASUG has a volunteer position where you can use your skills and give back to the ASUG/SAP community. As you can see, volunteering ASUG chapter activities improves the chapter and it also benefits the chapter member in many ways. We want to thank ASUG Volunteer Liz Futrell for her many years of service to the ASUG Virginia Chapter. Liz has attended most ASUG Virginia Chapter meetings, encouraging the speakers, posting signs, and a true ASUG champion. She will be missed. Fall ahead and please join the ASUG Virginia Chapter meeting, October 27th in Richmond, Virginia. We survey ASUG members on top locations, and right after Washington DC the second location members wanted to meet is Richmond. We are grateful to our gracious hosts Altria. Fairfax Water will share “Making Fairfax Water Great by Leveraging the SAP PM & MM Integration Relationship”. 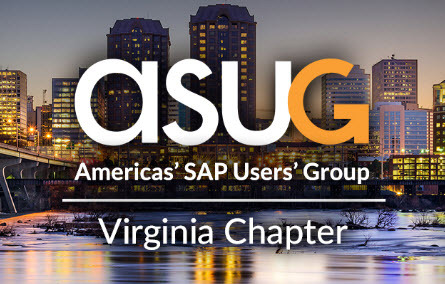 In case you missed the joint ASUG Virginia-Maryland Chapter meeting presentations are here with a meeting recap here.